While describing this recipe to a friend last night, he gently interrupted half way through my enthusiastic dissertation, with the question "Do you ever make anything quick and easy?" I acknowledged that I do, but it's rarely worth talking about. Food deserves time, creativity, reverence, passion. There's no other way to get the complexity of flavour, texture, visual stimulation, and nutrition. Meals deserve thoughtful attention, even when simply prepared. Take a pumpkin for example. It is a stunning work of art. I cannot think of more beauteous food than perfectly formed pumpkin. I include squash in this discussion, as many squash look like pumpkins, though few pumpkins look like squash. Squash also rivals pumpkins in taste and texture. Unfortunately, the word squash isn't appetizing. All these gourdy beauties require is oven roasting. Of course mashed, with a bit of butter and nutmeg, elevates them to gourmet status in my book. And since this is my book, I must pay tribute to my all time favourite autumn fruit. That's right, pumpkin is a fruit, not a vegetable. 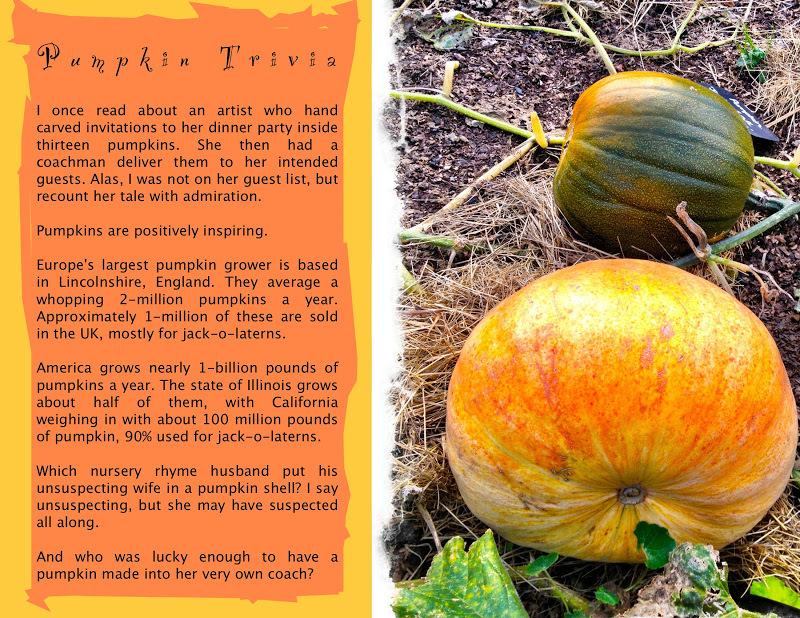 What other fruit, or vegetable, is as visually inspired and versatile as the magical Pumpkin? Okay. Tomatoes. I am even more enthusiastic about tomatoes, my favourite summer fruit. Pumpkins come in an astonishing range of colours, shapes and sizes. They grow on every continent of the world, except the Antarctica. Counting squash and gourds, there are hundreds of varieties. There are cooking pumpkins and pumpkins grown purely for aesthetic value, like the millions sold for jack-o-laterns every October. On top of all this, they're a low calorie, super food, high in beta-carotene. There are entire farms dedicated to the planting and harvesting of pumpkins. A single pumpkin can grow to well over a ton. That's right, over 1,000 pounds. America holds the world record for the largest pumpkins. Not surprising given the pumpkin's esteemed history dating back to 7000 BC in Mesoamerica. Native Americans depended on pumpkins to supplement their diet. Pumpkin seeds were used for medicinal purposes. Besides being an excellent source of protein, pumpkin seeds are also packed with anti-oxidants. Besides pumpkin pie, soup, breads and muffins, pumpkin is excellent in cookies, pancakes, casseroles, curry, tempura, pasta, and risotto. All of the pumpkin is edible, including the leaves and beautiful flowers. This is not a complicated recipe, but it is what I call a weekend feast because it takes two days to prepare, mostly unattended, but two days nonetheless. In exchange for a few hours of your weekend, you'll make the best risotto of your life. And if you, like me, consider making risotto your response to a higher calling, you don't need convincing, just a few tips. As any experienced risotto maker will tell you, it's all in the stock, preferably a slow roasted stock. I prefer the tenderness of twice cooked turkey legs. Here, we roast the legs before slowly boiling them. This results in as tender of turkey meat as you're likely to ever eat. The meat is a bonus with this recipe, as we're after the stock. Peel and thinly slice onions, place on large baking sheet. Wash lemons, slice into 4 - 6 slices, combine with onions to make a rack for the turkey to cook on. Rub the legs with olive oil and season with salt and pepper. Place turkey on the onions and lemons. Roast in hot oven 90 minutes. Turn once halfway through the roasting. When done, remove from oven and allow legs to cool for at least half an hour. By all means, help yourself to a bit of meat. You have plenty for the stock and snacking. When turkey has cooled enough to handle, place everything, legs, onions, lemons, and all the good drippings into a large stockpot. Add the sage and rosemary, no need to strip the leaves, you'll remove them when the stock is finished. Add enough water to the pot to cover, or nearly cover the meat. Bring to boil over high heat, then lower to a gentle simmer for the next three hours. Check the water every hour and top up as needed. After three hours, turn the heat off and allow the turkey and broth to cool in the pot. This will take another three hours. You can also make the stock in a slow cooker, doubling cooking time on low heat. When the meat is cool enough to handle, using a large colander and a second roomy pot, slowly pour everything into the colander, catching the broth with the second pot. This is your rich, brown risotto broth. You can use it right away, or refrigerate for a day, or two, until you make the risotto. Skin and shred the turkey legs, removing and discarding the skin and bone. Place in a container with a couple of ladles of the broth (you should have more than enough broth for your risotto) Use the meat for hot turkey sandwiches (slathered with homemade cranberry sauce) enchiladas, tacos, meat pies, and casseroles. Depending on where you live and the time of year, your pumpkin selection may be limited. Fortunately, there are numerous squash options offering everything pumpkins do, as they are entirely interchangeable. Ideally, you want something you can both eat and make into individual edible bowls. Pumpkin season is usually from early October to the end of December in the states and Great Britain. If you can't find pumpkins, go for butternut squash, gem squash, acorn squash, kabocha, onion squash, red kuri, or any attractive, roundish red, orange, or dark green squash. Wash all the pumpkins. Pierce in several places with a sharp knife. Place on baking sheet. Roast the serving bowl pumpkins in oven for about 40 minutes. You want them soft enough to easily turn into bowls, but not so soft they fall apart. Remove the pumpkins for bowls from the oven. Do not lift them by the stem, or it will likely break off. Allow to cool, then slice off the top, reserving it as part of your presentation. Scoop out all the seeds and pulp. Set the seeds aside in a large bowl for roasting later. Don't worry about freeing them from pulp. That comes later. Allow the pumpkins to dry out a bit. I usually set them out on the kitchen counter overnight. Continue roasting pumpkins for the risotto for another 40 minutes, or until soft. You will need to re-position them on the pan, as the skin will have scorched a bit at this point. Remove the eating pumpkins from oven when they are fork tender. Allow to cool. Then, just like with the bowls, slice off tops, scoop out seed and pulp, adding them to your seed/pulp bowl. Slice the pumpkin into manageable size pieces for peeling and cutting up for mashing. 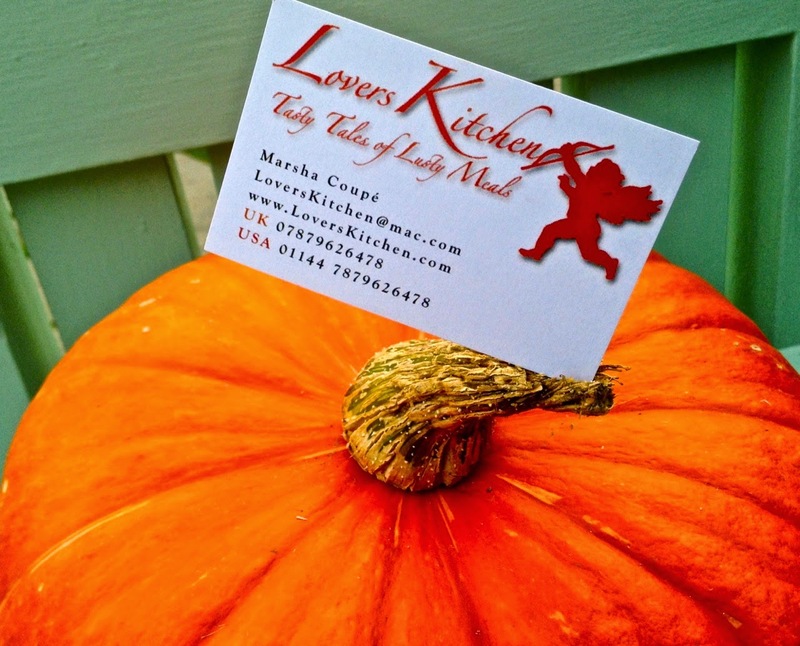 Once the pumpkins are peeled and cut into small pieces, mash with potato masher and soft butter. You want about 400g/15 ounces for your risotto. The rest can be saved for another meal. Mashed pumpkin makes a wonderful side dish. Collect the seeds in a big bowl. Add water to bowl and wash the seeds rubbing them vigorously between your hands. Then, rinse in colander under cold running water. Remove the thick, clingy pulp and strings, but don't worry about the finer stuff. Place seeds in a cooking pot, stir in a teaspoon of salt, cover with water, bring to boil, then reduce heat to low simmer for 10 minutes. Pour seeds back into colander. Rinse again. Spread out a large, clean, absorbent cotton towel (they stick to paper towels) on counter. Place seeds on it to dry. You can help them along along if you like, or just let them dry naturally. The drier the seeds, the crunchier they will be. Remove any especially gooey pulp that's still clinging to the seeds, but let the finer stuff go, It's quite tasty roasted. Coat the seeds well in olive oil and lightly salt. Spread them out into a single layer. Try to get them to cooperate as a single layer, spreading and separating as you go. Roast in hot oven about 40 minutes, 20 minutes on each side. Check on them ever 15 minutes or so, and give them a good toss about to encourage even roasting. After about 35 - 40 minutes, taste a couple of seeds. If you like the crunchy taste and texture, you're done, or ready to do the next batch. If your seeds aren't crisp enough, continue on until they delight you. Serve some of the seeds as adornment for your risotto. Set aside a small dish for the chef to nibble as you stir your way to culinary magic. The rest can be stored in air tight containers for snacks and garnishing roasted vegetables, soups and salads. If you're going to use the seeds right away, simply place them, including the pulp and stringy bits, on large roasting tray lined with baking paper. With your hands, mix with a big tablespoon of coconut oil and a generous sprinkle of coarse salt. Roast in hot oven, 150c/300F, about an hour, turning seeds every 15 minutes. Taste. You will have crispy, caramelized garnish to serve with your creamy risotto. 1. Use the best quality, most flavourful stock possible. 2. Use Carnaroli or Vialone Nano rice. 3. Take your time, then beat the risotto into creamy submission at the very end. 4. 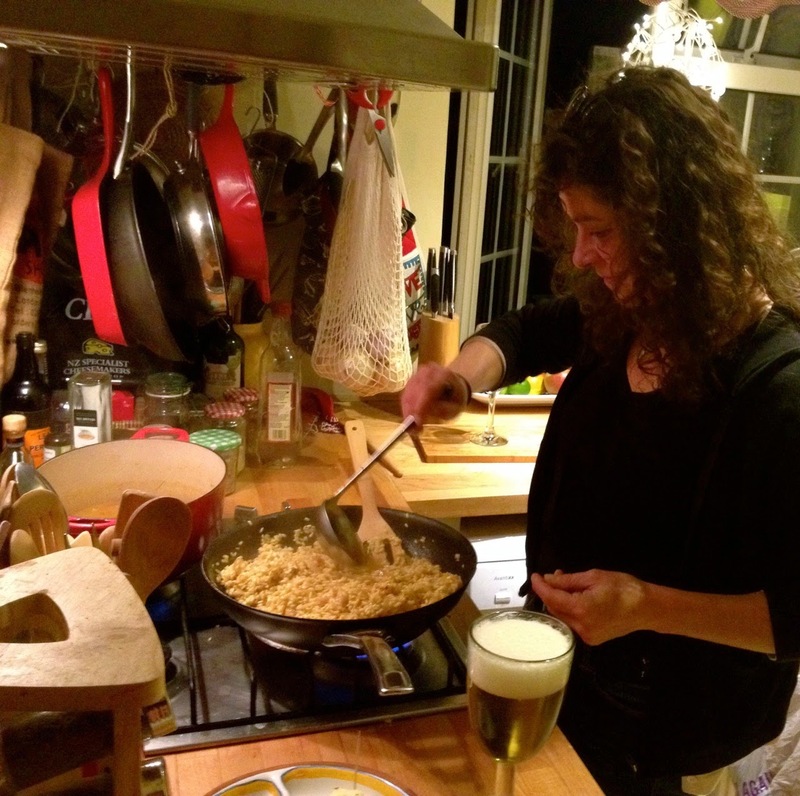 Do all your prep work in advance, as the risotto will require your full attention for about 30 minutes. 5. Use a large, heavy bottomed, deep-sided pot and a sturdy, wooden spoon, preferably with a hole in it. The hole is supposed to help you get more 'risottoness' out of every stir. * Echallion Shallots are long, amber coloured allium, also known as banana shallots. It's a cross between an onion and shallot. Easy to work with, slightly sweet, with a light oniony flavour. • Gently heat stock on the back burner, over medium heat. You want to keep the stock simmering away the entire time, as it needs to stay very hot. Have a ladle handy for dipping into the broth, one ladle at a time, as you make your risotto. • Peel and finely chop shallots and garlic. Set aside. • Toast pine nuts in hot oven until golden brown, about 12 minutes. Set aside. • Re-heat mashed pumpkin in oven, while preparing risotto. Be sure to keep it covered, as pumpkin dries out easily. • Grate the parmesan and set aside. • Cut butter into small, easily blendable pats. Set aside with cheese, we you'll be using these two ingredients together. • Open rice, don't rinse, you want all the starch you can get. • Pour olive oil into large, heavy pan. Heat over medium heat for about two minutes. Add chopped shallots and garlic. Cook until tender, about four minutes. Stir in the rice, coating with shallots and garlic for a couple of minutes. Stir rice in only one direction, whichever is most comfortable for you, but in only one, circular direction throughout the process. This will encourage the rice's crema. • Over medium heat, stir in one ladle of broth at a time until fully absorbed by the rice. Don't rush. Add another ladle of broth. Slowly stir rice until all the liquid is absorbed. Continue on with the rhythm of adding hot stock, one ladle at a time, and stirring the rice for at least 20 minutes. Taste. The rice should be tender and creamy, but not mushy. The whole ladle/stirring process takes at least 20 minutes. You probably won't use all the stock, but it's good to have a little extra. • When the texture appeals to you, remove rice from heat and beat in the butter and cheese, as vigorously as you can. When the butter and cheese are well blended, stir in the hot mashed pumpkin and pine nuts. Mix well. • Spoon risotto into individual pumpkins, or dishes. Garnish with toasted pumpkin seeds. If you prefer an all vegetarian risotto, make a stock of roasted vegetables using onions or shallots, garlic, some of the pumpkin, carrots, Italian peppers, and brussels sprouts. Don't be put off by the sprouts. When cut in half, rolled in olive oil and sprinkled with salt and pepper, they are out-of-this-world. See recipe for Roasted Vegetable Soup for details. The only dish I serve with risotto is a pretty salad made of fresh baby green leaves, a bit of radicchio, and a few thin strips of fresh beet, dressed with pumpkin, or walnut oil, and a smattering of pumpkin seeds. The crunchy, slight bitterness of the salad works beautifully with the creamy, almost sweetness of the risotto. 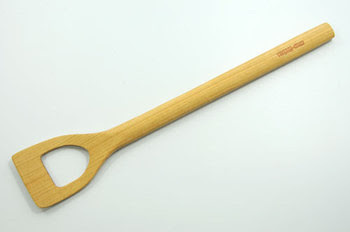 I've a serious hankering for the Alessi Risotto Spoon made from cherrywood. If you make a lot of risotto, you might think about treating yourself to one too. What better post-risotto film than The Pumpkin Eater with Anne Bancroft and Peter Finch? The 1964 British film's title was taken from the nursery rhyme, Peter, Peter, Pumpkin Eater. Luxury Item, the Alessi Risotto Spoon, for the chef who wants everything.